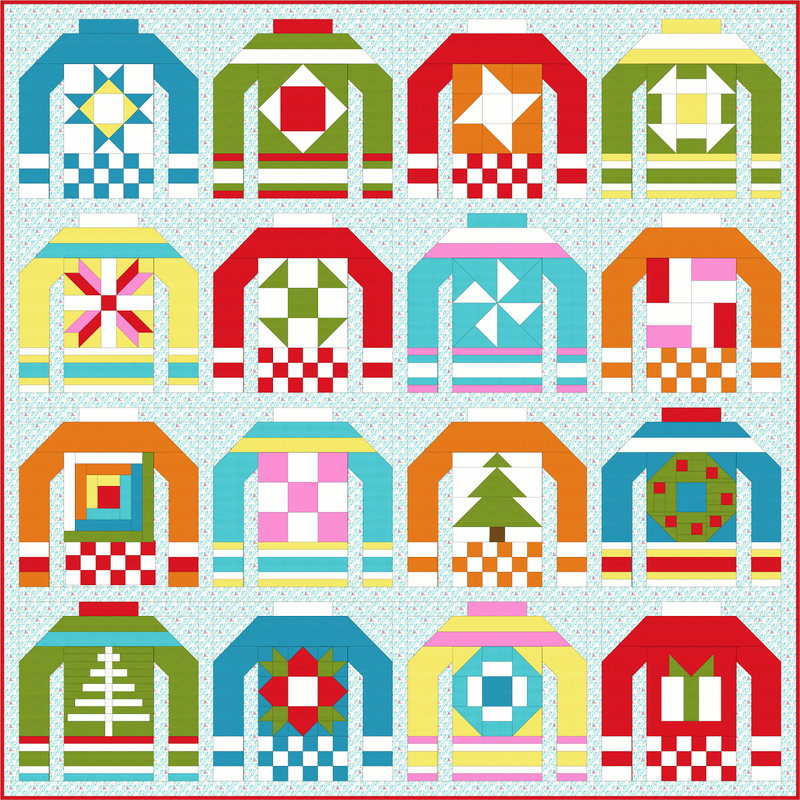 Welcome to the Ugly Christmas Sweater quilt along! I am really excited about this new idea for a quilt along. I know Christmas 2015 is over.... But if we start now, everyone should have finished Christmas quilt in time for Christmas 2016. Hahaha! Happily, Michael Miller Fabrics is as excited to see this come to life as I am, and will be sponsoring this project. Follow along and watch as these sweet solids from their Cotton Couture collection become the most adorable Ugly Christmas Sweaters you ever seen! For my samples I will be using Watermelon, Soft White, Orange, Mango, Canary, Turquoise, Luna, Asparagus, Acid green and Princess pink. Also Festive Nest for the background and for the backing, there is (appropriately!) Sweater Weather. Both are from the Festive Forest collection by Tamara Kate. Beginning February 1st, this quilt along will get underway and we would like to encourage you to quilt along. You can make as many or as few blocks as you like. Make a quilt or make a mini. Make a cushion. A table runner. A bed runner! Make whatever your imagination leads you to make! 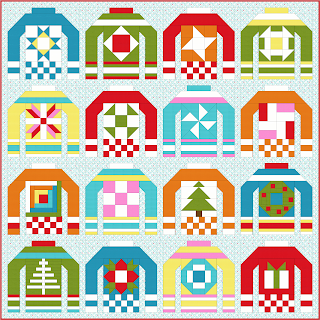 The Ugly Christmas Sweaters blocks finish at 12" square. And each block features a 6" block on the sweater. Using 1" sashing and borders, there are four sizes of quilts. 1 block Single Block Mini finishes at 14" x 14"
4 block Mini finishes at 27" x 27"
16 block Medium finishes at 53" x 53"
20 block Maxi finishes at 53" x 66"
Single Block Super Mini size 14" x 14"
4 Block Mini size 27" x 27"
16 Block Medium size 53" x 53"
20 Block Maxi size 53" x 66"
I will be sharing tutorials for some 6" blocks, two each week. Along with each block tutorial, I will also share the instructions for building the sweater block setting that I used. There are three designs. Here you can find the FREE Colouring Page for download to make your plan! These are adorable! I don't know how you do it and I can't even begin to keep up with you. This will have to be on my to-do list...love it! This is to cute Lorna, I'll definitely be following along. Love the pattern. I'll post the logo on my blog also. Lorna, I love MM CC -- but my LQS doesn't carry it! Any chance you'll have a kit available? I can't not participate, this quilt is so adorable! Sooo looking forward to it!!! I want to do this one! I'm a bit late to the party, but hopefully can catch up. It will be my first ever actual "quilt along, too". I've saved people's quilt blocks, but never actually done a quilt along.. Such a cute and happy way to use those HST leftovers! !